First of all, I really, really hope this event happens again next year! It was great, and went really well. The proceeds go to the local library, so it's a good cause. And it's a great way to connect with readers on the community level. Summer Kinard and I manned a booth together and had a fabulous time. Summer has great design sense and set up a great booth. of e-books to the winner. I had a newspaper photographer comment that wearing a shirt that matched the colors of my book was great for picture-style-sense. So, consider that a hint--match your books because it makes publicity photographers more likely to snap your picture! We sold a good handful of books, which in a window-shop style event with tons of great competition (I ended up buying a couple of books myself!) is better than expected. Even better was the number of readers we got to talk to, many of whom signed up for our newsletters. 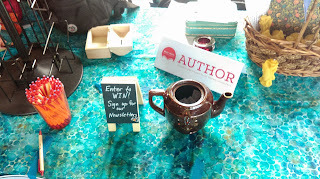 It might have helped that we were offering a drawing with a gift certificate to a coffee/tea/chocolate shop a couple of blocks away, but there were a few who only noticed the giveaway sign after signing up--win-win! We also offered a nice deal for the fair, which helped. I talked with another author who was offering a discount for 2 or 3 books, but not for a single book; she said no one took her up on that, though she sold a few of the first book. Offering a discount on each book did seem to help our sales, and throwing in a party favor--cute wax candles Summer had found--for buying more than one book made us a couple of extra sales. Since we had different books, most buyers who bought more than one bought a book from each us (sampler-style). Most of those who bought two, bought the book they wanted, and then the book from the other author for a friend/family member with different tastes. 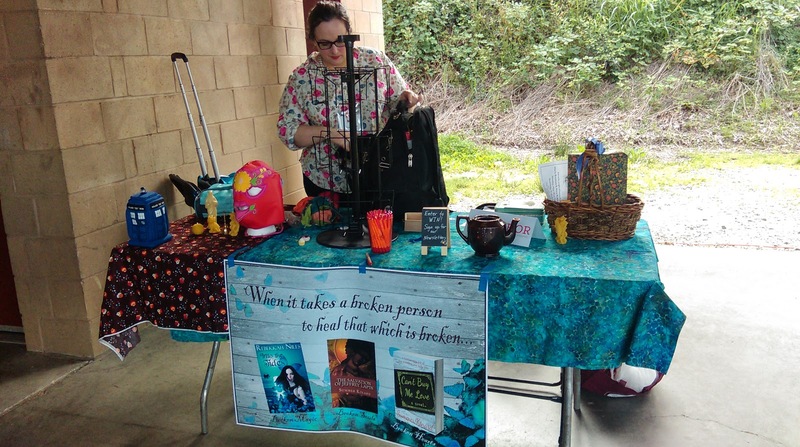 So pairing up with another author helped us both, and I think it was helpful that our books weren't perfectly matched in genre (inspirational paranormal romance + contemporary fantasy). Book covers were a huge draw. Never think covers aren't important. And bright colors attract eyes. 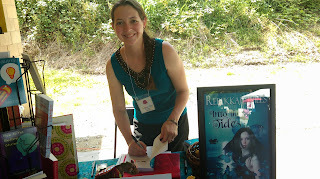 So if you're thinking of doing a festival event, go for color and make sure your brightest book is front and center. On the whole, a great event. Be sure to have a place for potential readers to sign up for your newsletter and some kind of promo material (bookmarks, postcards) for potential readers with heavy bags and light wallets to take home for later.